We Drink Your Milkshake! : OBLIVION Trailer Drops! Love him or hate him, Tom Cruise makes some fun action movies. I've always enjoyed him as an action star, and his new sic-fi action film looks entertaining as hell. Set in a futuristic Earth (which I'm spying a pattern for next summer), Cruise is a technician who cleans up drones years after a war has left Earth in shambles. However, during his last few weeks on the job, as always, he starts uncovering secrets including stumbling across a band of rebels led by Morgan Freeman. Maybe it's just because this is our first look at the film, but I can't tell if the film is just going to be a surface-level sic-fi film or if there is something greater going on in the background. There are hints of conspiracies and a bigger evil lurking in the plot, and hopefully the marketing is keeping the bigger plot points a surprise. Also, the aesthetic and design of the film looks pretty badass. 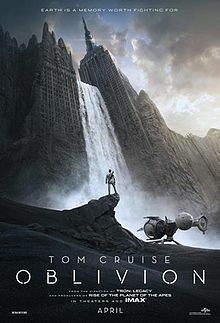 OBLIVION will open April 12, 2013 directed by Joseph Kosinski and stars Tom Cruise, Morgan Freeman, and Melissa Leo.